When Dorothy arrived in the magical Land of Oz, everything transformed from black and white to dazzling color. Color adds appeal to just about everything -- including printed documents. 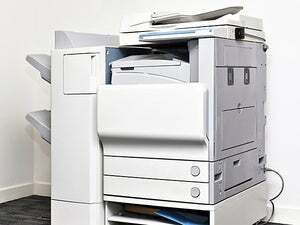 The Xerox Phaser 790DP is an impressive color laser business printer with ample storage and advanced features. We compared it with printers in our recent color laser roundup and found that for comping layouts and general business color documents, the Phaser 790DP ranks among the best, offering very high quality, but at a high price. The 790DP is worth the added investment only if you require its advanced features. The Phaser 790DP is large, measuring 28.7 by 19.3 by 24.2 inches and weighing 161 pounds. Although its size makes the printer somewhat cumbersome, setup is straightforward and the program's informative manual makes configuration easy. The 790DP delivers great paper handling for 20- to 100-lb. media, including coated and glossy papers. The Phaser 790DP supports paper sizes up to Super A3 (13 by 19 inches -- big enough to print full-bleed tabloid-size proofs). In addition, the 790DP has a built-in auto-duplex unit. During our tests, the auto-duplexer worked without incident, handling both monochrome and color documents. The 790DP uses Postscript 3, has a 6GB internal hard drive, and ships standard with 128MB of RAM and 10/100BaseT Ethernet, providing workgroup printing environments with everything right out of the box. With additional paper trays it's possible to increase paper capacity to 1,400 pages. Plus, the Phaser 790DP ships with full ICC, ICM, and ColorSync Profiles, and it's certified by Pantone. The 790DP's built-in Fiery RIP offloads the work of preparing complex graphic files for printing; the Web administration delivers sophisticated queue and job management. For comping layouts, preparing business graphics, and producing color documents, the 790DP delivers high-quality output at reasonable print speeds. For example, it took about 2.5 minutes to print our 19-MB Photoshop test document and about 2 minutes to print a 40-page Microsoft Word document. Maximum resolution is 600 by 600 dpi, which is lower than the 1,200 dpi offered by some competitors, but our tests show that higher resolution doesn't equal better output. Though no laser printer can yet deliver the photographic output of a photo-quality ink-jet printer, the 790DP offers strong color reproduction with a wide contrast range and excellent saturation. Plus, its prints are free of the characteristic sheen that often plagues laser output. The printer's color controls -- from rendering style to color standard -- are fully adjustable. And if you're using a calibrated system, the Phaser's advanced calibration controls make it possible to get the color you want.